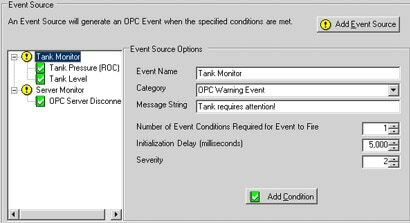 Create custom simple OPC A&E events based on real-time OPC process values. Create custom message strings, combine multiple conditions, connect to and monitor multiple OPC DA items from any OPC DA server. Combine this with the MatrikonOPC server for Windows Performance Monitor to create a powerful OPC health monitoring system. Generate events when applications use too much memory. Notify an operator if disk space becomes to low or if network traffic becomes dangerously high.